This is a complete identity overhaul for Venturenet. They were a leader in technology services but their company identity was dated. The new logo (designed by Ellen Hutchings) gave them a simple but strong modern feel. They really stepped outside of their comfort zone and let me design a site that not only separated them from their competition, but helped position them as forward thinking and pushing the limits on everything that they do. Do yourself a favor and go read the about > who we are section of the site. You will quickly see why this company is growing their business while most are going away. 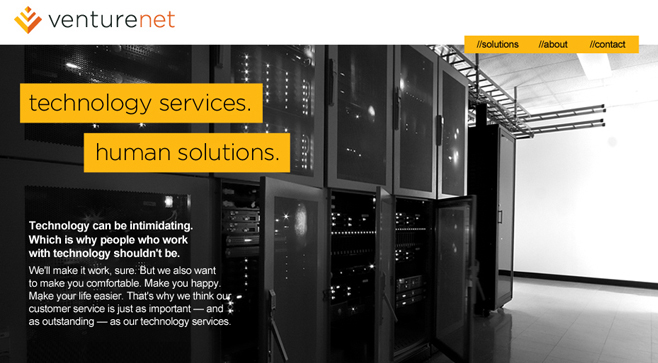 And to Venturenet…thanks for letting me be a part of your rebranding.